I've been a happy owner of one of your cement barbecues since 2011. Now I have to move and I'd like to take my trustworthy barbecue with me. Is it feasible? Is there a risk I might break it if I disassemble it and so it's best to leave it? if you used the special Betonfast® glue during the assembly stage as recommended by us in the assembly instructions, you'll be able to easily take your barbecue with you. Indeed, as well as providing resistance to high temperatures and ensuring elasticity and durability, this glue can "unglue" parts previously assembled together. To do this, you'll need a chisel with a fairly thin and sharp edge. 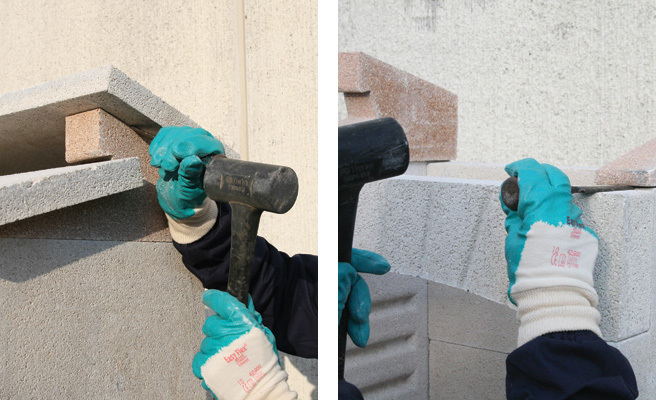 You'll need to pass it through the joints of the various pieces to "cut" through the layer of Betonfast® glue. Then separate the pieces by using the chisel itself as a lever through the various joints. This must be done with great patience and care to prevent any cracks. After removing the various pieces, you can re-assemble your barbecue in your new home. We hope we have answered your question. Thank you for choosing Sunday and please do not hesitate to contact us for further information.